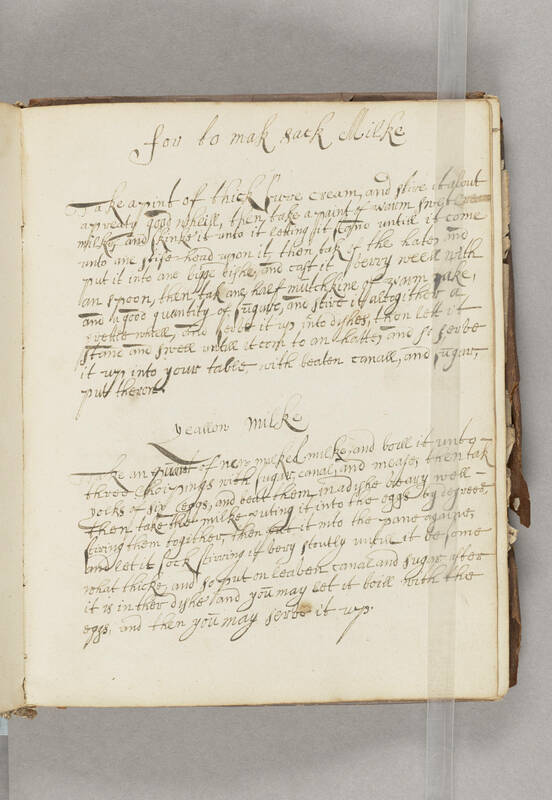 For to mak sack Milke Take a pint of thick pure cream, and stire it about a preaty good wheill, then take a paint of warm swet milke , and kinke it unto it letting it [illegible] untill it come unto one stife head upon it, then tak of the [illegible] and put it into one bigge dishe, and cast it verry weell with an spoon, then tak one half mulchkine of [warm?] Sake, and a good quantity of Sugare, and stire it altogither a prettie whiell, and Serve it up into dishes, then lett it Stand and swell untill it com to an [hatte? ], and so serve it up into your table, with beaten canall, and Sugar, put theron. Yeallow Milke Take an quart of new milked milke, and boill it unto three [illegible] with Sugar, canal, and mease, then tak yolks of six eggs, and beat them in a dishe veary well - then take the milke puting it into the eggs by degrees,stiring them togither, then put it into the pane againe, and let it [illegible] Stirring it very stoutly untill it be some what thicke, and so put on [illegible] canal and sugar after it is in ther dishe and you may let it boill with the eggs, and then you may serve it up.